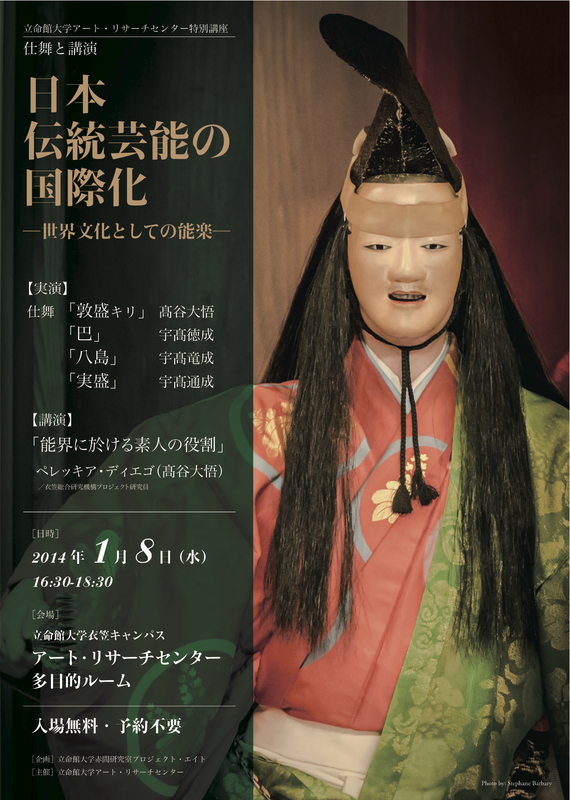 On January 8th 2014 the ARC Art Research Centre at Ritsumeikan University will host the event ‘Internationalisation of Japanese Performing Arts – Noh as Culture of the World’. The event combines performance, theory and discussion. See below for details (in English and Japanese). The first part features shimai dance excerpts by masters of the Kongo School of Noh Udaka Michishige (Sanemori), Udaka Tatsushige (Yashima) and Udaka Norishige (Tomoe). I will also perform a shimai under my stage name Takaya Daigo (Atsumori – kiri). In the second part of the event I will showcase my current research: ‘The role of amateurs in the world of Noh’, as a work-in-progress. In this lecture I will explore the various kinds of amateur practitioners that populate the cultural world of Noh and how their social, economic and political role has changed throughout history. Unlike other kinds art professionals, most Noh performers depend on teaching amateurs in order to socially and financially sustain their artistic activities. Noh is currently undergoing a difficult phase in its history, with dwindling audiences and a lack of young blood among its professional ranks. In order to look for trajectories of solution to these issues, I believe that is necessary to consider the role of amateurs as one of the pillars on which the Noh world is based, and understand the complex relationship between audience, amateurs, and professionals. 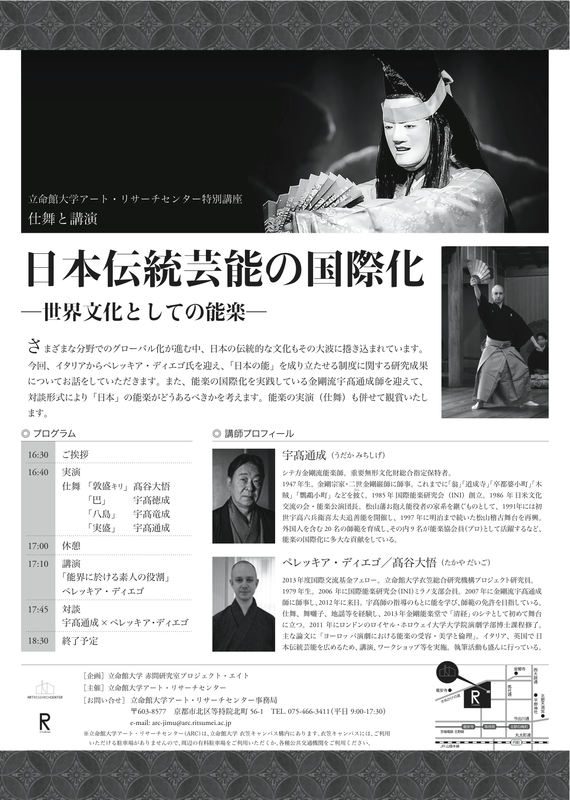 In the third part of the afternoon I will invite Udaka Michishige to discuss the role of amateurs in his experience as Noh actor and leader of the Kei’un-kai and of the INI International Noh Institute. 17:10 Lecture – The role of amateurs in the world of Noh -Diego Pellecchia (Visiting Researcher, Art Research Centre, Ritsumeikan University).